The Bryant Neighborhood Center is is both the future home of the current outreach programs at Trinity Presbyterian Church, and a space for potential community partners to use, offering programming that welcomes our community into this space. To accomplish this, we are working towards a $4.7M capital campaign. Read on to experience more of what a day in the completed BNC might look like, and consider supporting us in this journey! Special thanks to Tom Llewellyn for writing down this vision, originally shared at Trinity's 2018 Easter Service. The first thing you see is the sign. 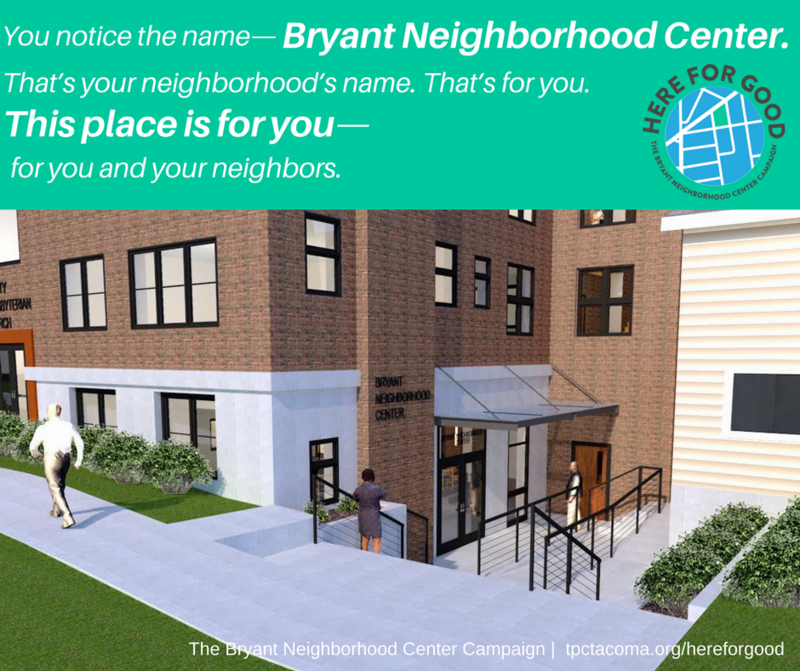 You notice the name—Bryant Neighborhood Center. That’s your neighborhood’s name. That’s for you. This place is for you—for you and your neighbors. And that’s who you see going in there. On a Monday morning, you hear and see a mob of preschoolers and their parents gathering in the new space—playing, creating, connecting with each other, and with professional parenting resources. You hear the sounds of kids playing—laughing, crying, shouting. You hear mothers and fathers talking—getting to know each other, building relationships. After the kids leave, you watch adults come for a workshop for medical resources—less fun, but practical—connecting these people—your neighbors in need—to services that help folks navigate the complicated system of healthcare resources. Then you see an after-school program. This one looks familiar. You recall it’s been going on for years, but here it is again, only this time it’s in a sparkling new space, brightly lit and brand new. And the quality of the space communicates something to you—a first-class level of love for your neighborhood and for the kids who live by you. And then you hear the sounds of play again. More laughing and shouting, along with running feet and balls bouncing—when the gym is opened up for supervised playtime—a safe place for kids to gather, a safe place for kids to do the best of human activities—to play. That same feeling of safety carries over to the next group that comes. This one is called the IF Project and it connects juvenile offenders to the resources and support they need to succeed on the outside. And that’s just Monday—just one day of a busy week. But there’s so much more to come in the rest of the week: support groups for Bryant Montessori parents, financial literacy classes, a professionally staffed health clinic, meeting space for community partners like AA and Youth For Christ. One of your favorite things to watch is the bike repair workshop, done in partnership with a local non-profit, helping turn well-loved bikes into well-working bikes. You like watching your neighbors find the clothes they need at Pat’s Closet. And you like watching when Tony’s Kitchen turns the Center into place of soup and conversation. And on Sundays, you see the space fill with kids from the church above. Seems like a nice church. Seems like nice people. But your eye keeps returning to that sign: Bryant Neighborhood Center. You smile when you look at it, because it means something—to have a space just for your neighborhood. Because, you know, lots of folks talk about helping, but talk is cheap. But that kind of dedication—I mean, such a nice place—such a busy place, just for your neighborhood. Well, that’s kind of what love looks like, doesn’t it?